In previous years every month I was posting major free events in Sydney, but this year I decided collect all annual events into one list instead of monthly listing. It will be easier to make your plans during a year. Thought some events don’t have date announced yet so this list will be updated through a year. 1 Start a New Year with wonderful fireworks in Sydney Harbour at midnight. 5 Harbourside fireworks at Darling Harbour from 21:00 (9PM). 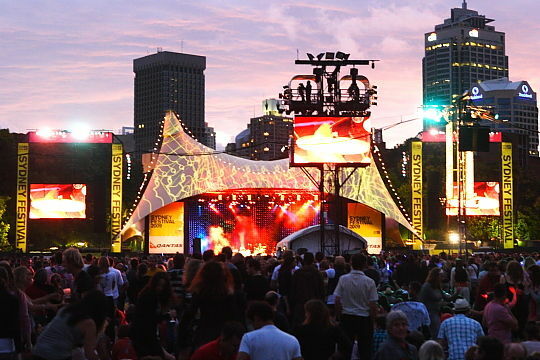 5 – 27 Sydney Festival 2013. Check official website for the list of free events. 11 and 13 check free performances at Micro Parks in Sydney. 12 Harbourside fireworks at Darling Harbour from 21:00 (9PM). 18 – 27 Centennial Park Light Garden. As the sun sets over Sydney in late January, you’ll be able wander through the spectacular illuminated Light Garden in Centennial Park. 19 Harbourside fireworks at Darling Harbour from 21:00 (9PM). 26 Australia Day. Head to The Rocks this Australia Day for a free celebration of music and song. 2 Harbourside fireworks at Darling Harbour. 8-24 Celebrate Year of Snake in China Town in Sydney with Chinese New Year Twilight Parade as the highlight of the New Year festivities on 17th of February and watch dragon boats race on 23-24th. 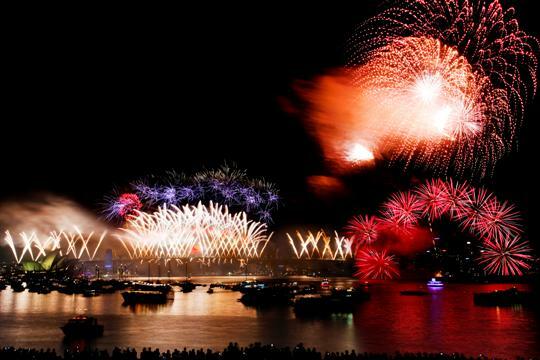 9 Harbourside fireworks at Darling Harbour from 21:00 (9PM). 14 Harbourside fireworks at Darling Harbour from 21:00 (9PM). 16 Harbourside fireworks at Darling Harbour from 21:00 (9PM). 17 Short film festival’s Tropfest main event will take place at The Domain. Go there early as place fills up very quickly. 23 Harbourside fireworks at Darling Harbour from 21:00 (9PM). 2 Harbourside fireworks at Darling Harbour from 21:00 (9PM). 3 From 19:45 to 22:00(7.45-10.00pm) at Oxford Street and Flinders Street watch colorful and outrageous Sydney Mardi Gras Parade. About 300000 spectators attend parade so get earlier there to take good spot. 17 From 12:00 to 18:30 (6.30pm) annual Sydney St Patrick’s Day Parade commences from the corner of Bathurst and George Street to Hyde Park. 21 March – 3 April Easter show at Sydney Showground in Sydney Olympic Park. The Easter Show is Australia’s largest annual event, an iconic showcase of Australian culture, heritage and excellence. It combines innovation, heritage, education and entertainment. It is not free event, but tickets include transport as well as admission to the Show. 22 March – 1 April Sydney family show as always at Sydney’s Entertainment Quarter. Thought it is more kids, but it is free entry event packed with fun activities the whole family can enjoy. Though you need to buy tickets for rides you want. 23 from 20:30 to 21:30 (8.30pm-9.30pm) the annual lights-out event Earth Hour will be held. It start couple years ago in Sydney, but now over 5000 cities across 135 countries are involved. 29 March – 1 April visit Hoopla festival at Darling Harbour. Australia’s annual circus, sideshow and street theatre festival. 1 Hoopla festival continues at Darling Harbour. 1 Last day of Sydney family show at Sydney’s Entertainment Quarter. 1 – 3 Easter show continues at Sydney Showground in Sydney Olympic Park. 6 Harbourside fireworks at Darling Harbour from 20:30 (8.30PM). 13 Harbourside fireworks at Darling Harbour from 20:30 (8.30PM). 20 Harbourside fireworks at Darling Harbour from 20:30 (8.30PM). 25 ANZAC day – a national day of remembrance. The day starts with dawn service at Martin Place and following parade on George Street. 27 Harbourside fireworks at Darling Harbour from 20:30 (8.30PM). 4 Harbourside fireworks at Darling Harbour from 20:30 (8.30PM). 11 Harbourside fireworks at Darling Harbour from 20:30 (8.30PM). 17 May – 23 June If you love photography you must visit Head On Photo Festival. Events this year are spread across Sydney from the CBD extending, north, south, east and west. Aside from traditional venues such as art galleries and museums, exhibitions and events were set in less formal venues such as cafes, pubs and Centennial Park. 18 Harbourside fireworks at Darling Harbour from 20:30 (8.30PM). 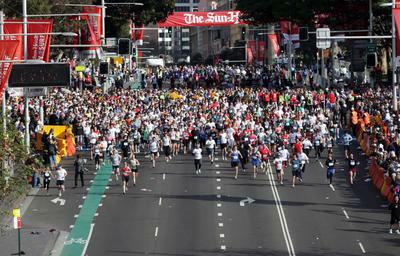 19 Sydney Morning Herald Half Marathon is held. It is Australia’s largest and most prestigious half marathon and you still have time to join it. This year introduced one lap course. 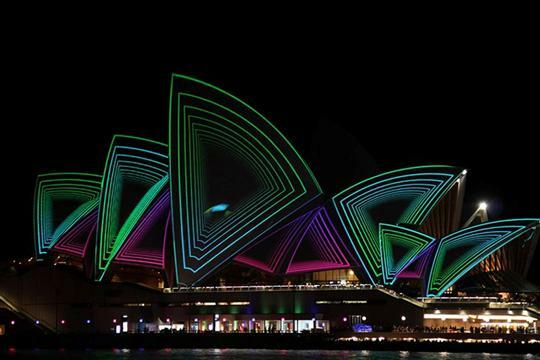 24 May – 10 June one of most colorful festivals in Sydney – Vivid Sydney 2013. Two weeks you can enjoy impressive light projections, performances from local and international musicians as part of Vivid LIVE and a free outdoor exhibition of interactive light sculptures. 25 Harbourside fireworks at Darling Harbour from 20:30 (8.30PM). 1 Harbourside fireworks at Darling Harbour from 20:30 (8.30PM). 1 – 10 Vivid Sydney 2013 continues around the city. 1 – 23 Head On Photo Festival continues. 5 – 16 60th annual Sydney Film festival takes place. It is always full of interesting movies to watch. Check screening schedule on their website. 7 Harbourside fireworks at Darling Harbour from 19:30 (7.30PM). 8 – 10 Darling Harbour Jazz & Blues Festival. The Darling Harbour Jazz & Blues Festival showcases legendary names in jazz and blues, rubbing shoulders with emerging and young Australian musicians. 8 Harbourside fireworks at Darling Harbour from 20:30 (8.30PM). 15 Harbourside fireworks at Darling Harbour from 20:30 (8.30PM). 22 Harbourside fireworks at Darling Harbour from 20:30 (8.30PM). 29 Harbourside fireworks at Darling Harbour from 20:30 (8.30PM). [TBA] State Library presentes World Press Photo 2013 exhibition. [TBA] International Food safari at King Street Wharf. Check it to taste various international cuisine. [TBA] Winter Festival at Bondi beach. Watch ice hokey games or Disney on Ice or try ice skating yourself. [TBA] Australia’s biggest coffee event Aroma festival takes over the historic laneways of The Rocks. Full month – July is peak month for whale watching in Sydney. 11 city2surf is one of Australia’s favorite event and even you are not runner go to cheer for participants of this 14 kilometers run from city center to Bondi beach. 8 11:00 – 16:00 (11am – 4pm) Festival of the Winds most colorful spring festival in Sydney. Head to Bondi beach to see lots of kits in the air. 20 September – 20 October Art & About Sydney with opening party in Martin Place. A lot of different events and exhibitions to explore art around the city, in laneways, parks and galleries. Check it here for full list of venues. 1 – 20 October Art & About Sydney continues. [TBA] Latin American festival Australia’s largest annual festival at Darling Harbour. [TBA] Sydney Travel Expo at Sydney Town Hall. FREE entry. [TBA] Santa Claus is coming to Sydney. 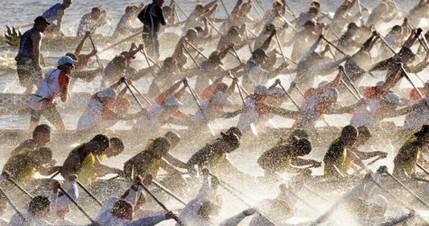 Darling Harbour transforms into a sea of red and white jolly men for the Santa Fest Water Spectacular. There’ll be Santas popping up all over Darling Harbour doing everything from water skiing to stilt walking! [TBA] fireworks at Darling Harbour every Saturday from 9pm in November. until 25th Christmas projections in the city. [TBA] the biggest Christmas (Carols in the Domain) concert in Australia will be held in Sydney. [TBA] Sydney Hobart Yacht Race starts. 31 famous Sydney New Year Eve fireworks. Thanks for sharing information of Sydney. Can’t wait for the February fireworks! So many things to do in Sydney with so little time! I’m planning a trip later this year to go out and can’t wait to check out the Latin American Festival as well as the yacht races. Thanks for the tips! I’d like Sydney and I’d love to travel to this scene and use the beauty of this mourning city.